Jackson Pollock was more than a great artist, he was a creative force of nature. He changed not only the course of Western art, but our very definition of "art." He was the quintessential tortured genius, an American Vincent van Gogh, cut from the same unconforming cloth as his contemporaries Ernest Hemingway and James Dean—and tormented by the same demons; a "cowboy artist" who rose from obscurity to take his place among the titans of modern art, and whose paintings now command millions of dollars. Here, for the first time, is the life behind that extraordinary achievement—the disjointed childhood, the sibling rivalry, the sexual ambiguity, and the artistic frustration out of which both artist and art developed. Based on more than 2,000 interviews with 850 people, Jackson Pollock is the first book to explore the life of a great artist with the psychological depth that marks the best biographies of literary and political figures. In eight years of research the authors have uncovered previously unknown letters and documents, gained access to medical and psychiatric records, and interviewed scores of the artist's friends and acquaintances whose stories had never been told. They were also the first biographers in twenty years to benefit from the cooperation of Pollock's widow, Lee Krasner. The results of these unprecedented efforts lie before you: a rich, sprawling, landmark biography of one of the most compelling figures in all of American culture; a brilliant, explosive "portrait of the artist," intimately detailed, abundantly illustrated (with more than 200 photographs from Pollock's life and work, many of them never before published), and filled with new information and new insights. In a style as richly textured, engrossing, and poignant as the best of contemporary literature, Steven Naifeh and Gregory White Smith give us the family crucible out of which the artist and his art emerged. Beginning with Jackson's birth on a sheep ranch in Wyoming, we follow the Pollock family on a relentless trek across the American West, as their dreams of a better life somewhere else are repeatedly frustrated. 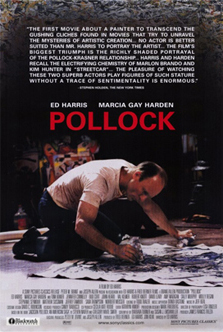 We see the young Jack Pollock as a struggling art student in New York, escaping into drunken rages or throwing himself into the Hudson River in one of several attempts at suicide. 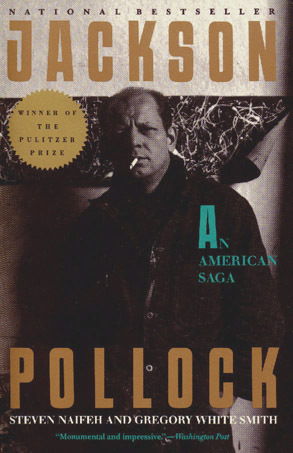 But Jackson Pollock is more than the epic story of a tormented man and his sublime art, it is also a compulsively readable, sweeping saga of America's cultural coming of age. From frontier Iowa to the dust bowl of Arizona, from the twilight of the Wild West to the desolation of Depression-era New York, from the excitement and experimentation of the Mexican muralists to the fanfare of the Surrealists' visit to America, from the arts projects of the WPA to the explosion of interest and money that marked the beginning of the modern art world, Pollock's story unfolds against the dramatic landscape of American history. From the Prologue: "I'm going to kill myself." Tony Smith recognized Jackson Pollock's whiskey voice. The late night call was not unusual for Jackson. Even talk of suicide had the air of ritual about it. Yet there was something in Pollock's voice that Smith hadn't heard before, a harder edge that alarmed him. With his ample Irish charm he tried to calm the distant voice, but Pollock was inconsolable. "Hold on," Smith finally said. "I'll be out." He put down the phone and drove off into the night in the middle of an early spring downpour. It would be hours before he could reach Pollock's house at the eastern end of Long Island—hours in which, knowing Jackson, anything could happen. It was March 1952, only two years after Pollock's breakthrough 1949 show at the Betty Parsons Gallery gave the emerging avant-garde art world its first bright, bumptious triumph; only a little more than a year after the vast, luminous landscapes of Autumn Rhythm and Lavender Mist dazzled and confounded the critics; only five years after Clement Greenberg pronounced him "the most powerful painter in contemporary America"; only two and a half years after Life magazine thrust him into the spotlight of America's celebrity-mad postwar media, making him, virtually overnight, American art's first "star." As the drive through the darkness and the downpour stretched into its fourth hour, Tony smith must have wondered, as many others had, what strange, reverse alchemy could have transformed so much acclamation into such self-destructive agony. Smith knew that Pollock was drinking again. After two enormously productive and relatively dry years—even in the driest seasons he kept cooking sherry buried in the backyard—Jackson had gone back to the bottle. He had always been, in Greenberg's phrase, "an alcoholic in excelsis," but drinking itself was never the problem. Even when it began with beer in the morning and ended with bourbon at night; even when its roots reached back to junior high school, or further, to an alcoholic father; even when his life dissolved, as it had several times over the last twenty years, into a series of drunken binges punctuated by hospitalization, drinking alone could not explain what was happening to Pollock. It couldn't explain the long, plaintive discussions about suicide with friends. "It's a way out," he told Roger Wilcox one day, to which Wilcox replied, "How the hell do you know? You may get yourself into worse trouble." Drinking alone couldn't explain why, just a few months earlier, Pollock's new Cadillac convertible—bought as a boast of success—had skidded off a dry road and wrapped itself around a tree. Jackson walked away unhurt, but those who knew him, like Tony Smith, knew that he would try again—and not because of alcohol. There was something behind the drinking that was pushing at Jackson from within, tormenting him, even trying to kill him. Jackson Pollock had demons inside. Everyone could see that. But no one knew where they came from or what they wanted.